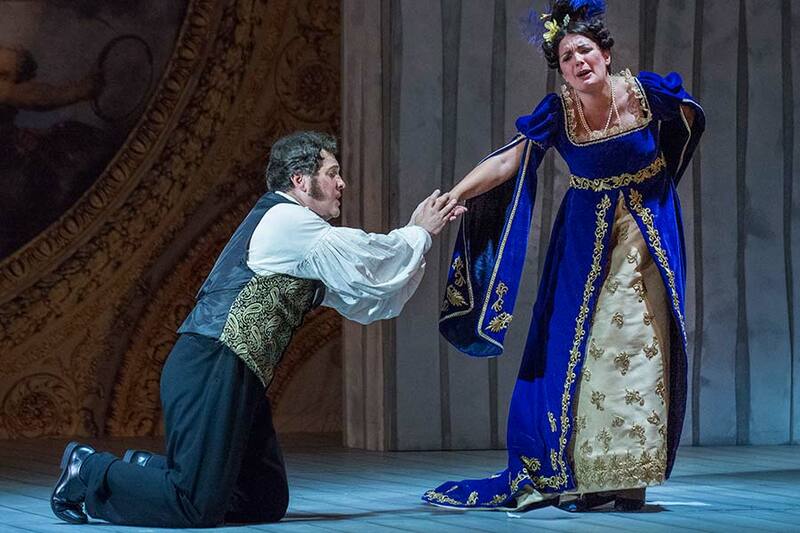 Eugene Onegin contains wonderfully evocative choruses; glorious arias for Onegin, Lensky, Prince Gremin, and famously Tatyana’s ‘Letter scene’; all topped off with Tchaikovsky’s thrilling Polonaise. 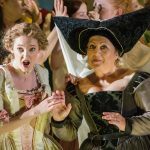 Dorset Opera, going from strength to strength, falls outside the usual summer festival jamboree. Picnics in idyllic grounds, yes. Formality and black-tie, no. Founded by a local woodwind teacher and conductor, Patrick Shelley, in 1974, it is now run by the expansive, problem-solving Roderick Kennedy, a former bass at opera houses around the world. The company moved in 2011 from squashed premises at Sherborne school (“Memphis is on the left and Thebes is on the right. I leave the rest to you”, was the alleged stage direction for Aida) to Bryanston’s more spacious theatre. Essentially a summer school, it is a perfect union of high professionalism and community effort. Local volunteers sew, paint, chivy, usher, host. All music, production and technical staff are experienced professionals. The formidable young chorus, mostly aged 16-25 and from all over the world, pay a reasonable fee for full-board accommodation, costumes and scores. Some bursaries are available, especially for Dorset-based participants. They have a total of 10 days to learn two operas and their productions (Verdi’s Macbeth was performed on alternating nights). For Eugene Onegin this included several combinations of dance steps, simple in themselves maybe, but tricky to carry off with such carefree aplomb. The newly commissioned English translation – the deft and musical work of Christopher Cowell – was a bonus, a fresh alternative to the familiar David Lloyd-Jones version. 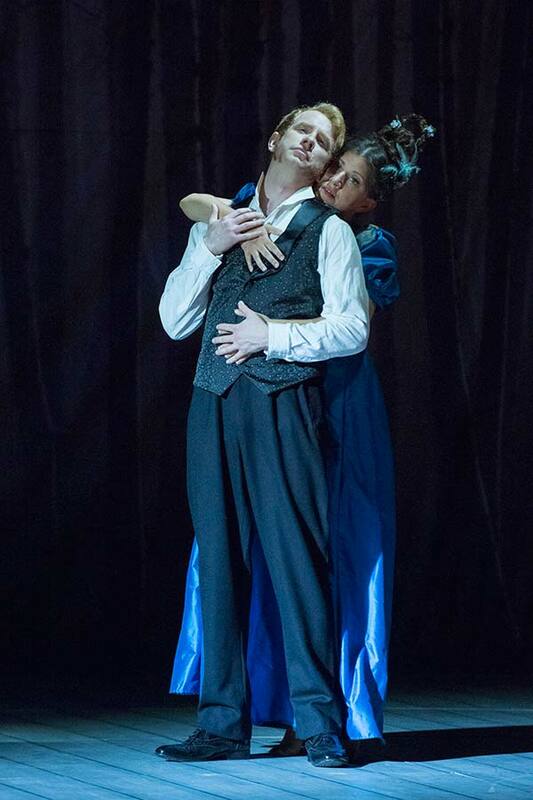 Directed with clarity and lack of fuss by Paul Carr, Onegin was conducted with slow-burn authority and conviction by Gavin Carr (they are both singers, as well as brothers). A terrific cast was led by Mark Stone, unusually open and direct in the brutish title role, and Anna Patalong as a serious, intelligent, responsive Tatyana, compelling in voice and stage presence. Tamara Gura shone as the over-eager Olga while Luke Daniel was a youthful, persuasive Lensky, uneven in top notes (he recently switched from baritone to tenor) but bursting with promise. 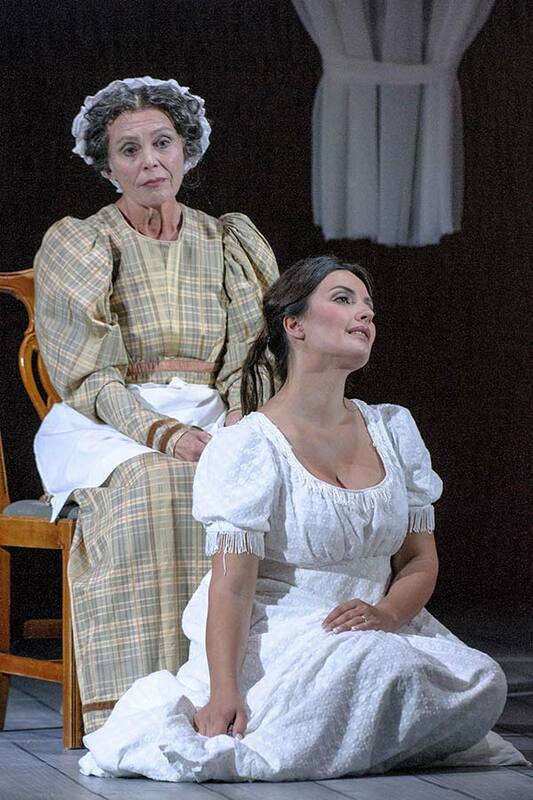 The cameo roles were a deluxe lineup: the British mezzo-soprano Diana Montague can still sing anything with ease and grace, as her Madame Larina proved. Fiona Kimm’s “elderly” nurse Filippyevna, Brindley Sherratt wise and forgiving as Prince Gremin and, especially, David Rendall as Monsieur Triquet added true class. Rendall (Mr Diana Montague) lavished humour and wit on every phrase in his showpiece aria: all the more affecting since this was a return to the stage after a backstage machinery accident, which effectively forced him into retirement in 2005. The chorus excelled, and the orchestra – an impromptu band of UK professionals happy to spend a week in Dorset – had the benefit of confident and eloquent woodwind soloists, critical in this score, to carry through uncertainties in elsewhere. A few stray notes are irrelevant when music is played with this level of engagement and pleasure. WHEN Tchaikovsky decided to adapt Pushkin’s beloved verse novel Eugene Onegin, it gave him not only an opera but a ballet, both of which continue to move, enthral and delight audiences the world over. The opera has provided Dorset Opera Festival with its finest moment at Blandford, bringing tears and cheers from the packed Coade Hall on the opening night. 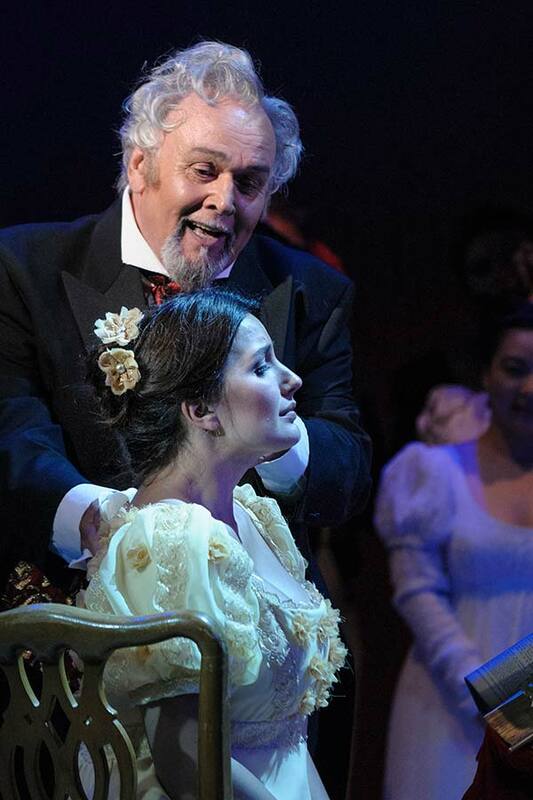 Paul Carr’s production, played on Steve Howell’s spare and effective set, evokes the “Russianness” that the piece demands, and the company had gathered its most impressive list of soloists, bringing energy and charisma to these highly charged roles. On Madame Larina’s country estate, sisters Tatyana and Olga sing of unrequited love and their mother and old nurse reminisce about their own youth. Diana Montague makes her welcome Dorset Opera debut as Larina, with Fiona Kimm as Filippyevna, Anna Patalong (pictured) as a mesmerising Tatyana and Tamara Gura as the playful Olga. 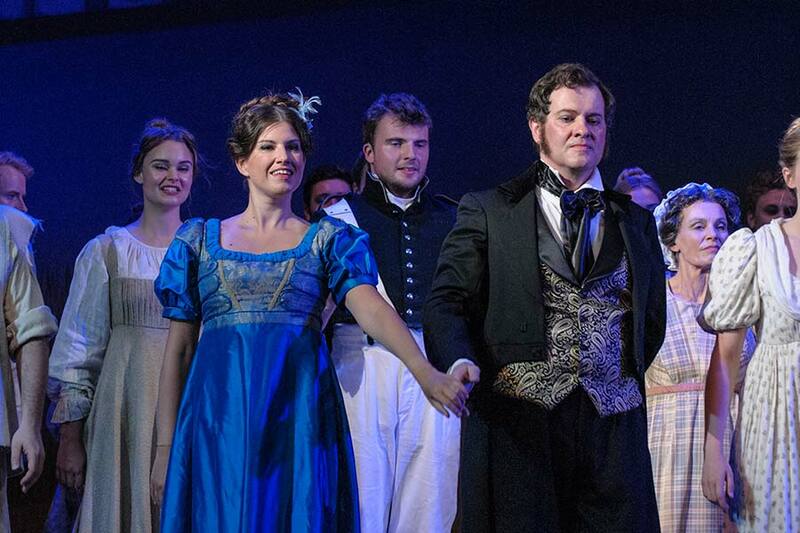 Neighbours Lensky and his friend Onegin arrive, Lensky proclaiming his love for Olga, while the arrogant and selfish Onegin entraps the affections of the naive Tatyana. Such is the passion of her new-awakened love that she spends a torrid night writing to her would-be lover – I have never heard more sustained (or more deserved) applause for a performance at Dorset Opera than for Anna Patalong’s Tatyana. After his cruel rejection of her letter, Onegin flirts with Olga at Tatyana’s name day party, enraging Lensky to challenge his friend to a dual. Inevitably, it is Lensky’s body that is carried from the field. Two years later, at a ball in St Petersburg hosted by Prince Gremin, his relative Onegin arrives direct from a long sea voyage. He quickly realises that the Prince’s new wife is Tatyana … and that he is in love with her. But although she still loves him, she is faithful to her husband, and Onegin finally suffers the consequences of his cruelty. This high drama requires exceptional acting, and the Dorset Opera cast, backed by the excellent chorus (which has to dance as well as sing in this stunning production choreographed by Alicia Frost) captures the intensity and atmosphere of Pushkin’s tragic story. 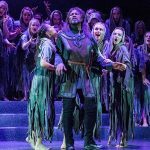 Dorset Opera annually fills the Coade Hall with enthusiastic opera-goers delighted at the chance to hear exceptional singing in high-quality productions without the need to travel to London or Glyndebourne. This sensational Eugene Onegin proves just how good the company has become, with a first rate orchestra under the baton of Gavin Carr and soloists of the calibre of the marvellously musical bass Brindley Sherratt as Gremin, David Rendall making a welcome appearance after an accident that brought his international career to an abrupt end in 2005 delighting the audience as a comical Triquet, and Mark Stone in the title role. Artistic director Roderick Kennedy was particularly pleased to engage the young tenor Luke Daniel as Lensky. Luke performed in the DO chorus, as a baritone, in the past, but in recent months moved to Bath and worked with Gavin Carr, who suggested he began singing as a tenor. That suggestion has launched a promising career and Blandford audiences are in at its start.